This review will take a close look at Sustainable Youth Night Serum, that is designed to help skin rejuvenation as you sleep when your whole body goes into “repair mode”, giving your skin the time to restore and rebalance. The manufacturer claims that potent ingredients provide results overnight and long term, leaving skin restored and rebalanced. 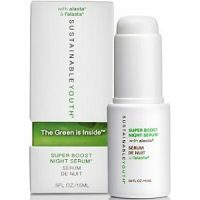 What’s in Sustainable Youth Night Serum? The ingredients provide the skin with various benefits. Alasta, a concentrated anti-aging ingredient derived from inside the rind of the Aloe Vera leaf provides soothing and hydrating benefits, while improving skin firmness, resulting in youthful, radiant skin. Ficus Carica (Fig) Fruit Extract has anti-oxidant and nourishing properties. Rosewood Oil is useful for natural skin regenerating, skin elasticity and cell stimulation in treating wrinkled, mature and aging skin. Black Spruce provides hydration for dull and dry skin. How do you use Sustainable Youth Night Serum? Pump four to five drops onto fingertips and gently massage on cleansed skin before bed.For best results follow with Elasticity Cream and Anytime Lift Eye Treatment. 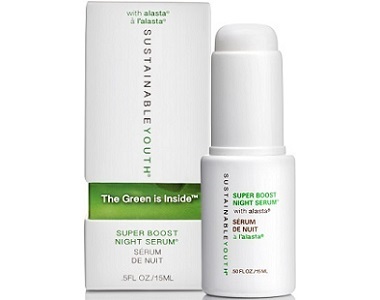 Sustainable Youth Night Serum costs $150.00 and can be purchased through the manufacturer’s website. Unfortunately we could not find it anywhere else, which means that you can only buy it from the manufacturer. This is a pity because you can at least choose a better deal when you have more options. This price is high compared to that of similar products on the market. Sadly, there is no money-back guarantee on this product, meaning that you cannot return it for a refund if you are unsatisfied with results. This indicates that customer satisfaction is not the priority of the manufacturer. It also shows that they do not really trust the effectiveness of their product. Sustainable Youth Night Serum seems like a promising product. All the active ingredients in it are extracted from natural plants and fruits, which makes it safe. Unfortunately, there are many things that worry us about this product, such as lack of money-back, guarantee, consumer reviews and its high price. Consumer reviews are important for prospective consumers so that they can read what other customers experienced from the product. Lack of reviews gives an impression that no one or very few people have bought the product. Furthermore, lack of guarantee indicates that the manufacturer is not confident on the effectiveness of the product. Lastly, this product is only available through the manufacturer’s website, which is a problem because it is very expensive, and therefore you can’t buy it from anywhere else. There are also no discounts offered, which means that it is even more expensive when shipping costs are included. Due to these reasons, we do not recommend Sustainable Youth Night Serum.